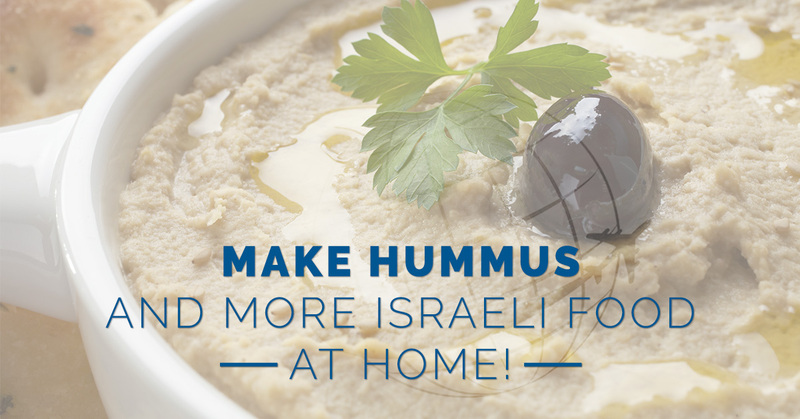 Trips to Israel: Make Hummus and More Israeli Food at Home! No matter why you choose to visit Israel, you can’t help but make note of the amazing food found all over the country. Even if you’re making a religious pilgrimage to the Holy Land, you get the unique opportunity to enjoy everything that the country has to offer, ranging from the deep history to the incredibly eclectic food offerings. Even if you are simply traveling to see a new country, the culinary aspect of Israel shouldn’t be ignored. In fact, we bet you come back from your trip wanting more of the famous local food offerings. That’s why here at World Express Travel, we’ve collected a wide variety of popular Israeli food offerings for you to try making at home after you get back from your trip to Israel. To understand the type of food you’ll typically encounter throughout the country, you need to understand a bit about the Mediterranean diet. Considered one of the healthier ways of eating from around the world, the Mediterranean diet consists of many different type of vegetables with lower quantities of meat protein. In addition, olive oil is a staple of the Mediterranean diet, and often the more olive oil, the better. This diet probably originated thousands of years ago when agriculture dominated the way of life in the area. Between this and the moderate temperatures seen throughout much of the year, vegetables dominated the diet. Israel’s cuisine has a unique blend of the Mediterranean diet with the cultural heritage of many different groups that have helped to develop the unique flavor profiles you’ll find here. An Israeli salad is simply a type of salad that consists solely of chopped vegetables and some seasonings. The most common vegetable choices are often tomato, onion, cucumber, and bell pepper. Once you make a batch of Israeli salad, it’s delicious on it’s own or consumed with pita chips. To make this recipe, simply chop up all your vegetables and herbs and place in a bowl. Add your seasonings and stir thoroughly. Place in the refrigerator until you’re ready to serve it. We promised to provide you with a delicious hummus recipe that you can make at home, and we never renege on a promise. This basic hummus recipe can be found online with Food52 and is both easy to make and delicious in its results. Give it a try and you’ll have to make a batch at least once a week. Soak the dried chickpeas in a bowl of water over night. The next day, drain the chickpeas after they’ve doubled in size. Place the chickpeas and the baking soda in a saucepan and saute them for a couple of minutes. Add water to cover the chickpeas and bring the water to a boil. Skim the top as needed. It will take anywhere from 20 to 40 minutes for the chickpeas to soften so they can be easily crushed between your fingers. Drain the chickpeas and place them in a food processor. Grind up the chickpeas, and with the processor running add the other ingredients in order until you have a smooth texture. Don’t eat the hummus right away, but let it rest for about 30 minutes. When it’s ready to eat, add olive oil to the top and dig in! Burekas are eaten in many different parts of the world and for the simplest description, they’re essentially a savory turnover. Many different cultures have their own take on stuffed burekas, and Israel is no exception with this delectable potato and vegetable rendition of a turnover. For the filling, place the fennel, shallot, and celery in a hot skillet and cook until soft. Add in the potatoes, olive oil, feta, and spices to heat up and mix. Set the mixture aside and let cool. Preheat your oven to 350 degrees F. Oil a cookie sheet and get out your filo dough. Using 4-5 layers, fill them with roughly ¼ cup of filling. Roll them up so they look like a little burrito, making sure to oil the edges that meet. Place on the cookie sheet seam down and oil the outside. Sprinkle the outside with a little za-atar spice and bake about 25 minutes or until golden. On your trip to Israel, take the time to truly experience the culinary culture that is unique to the region. Your tastebuds will certainly thank you. Let World Express Travel help you plan the perfect trip that lets you explore the food of Israel as well as the rich history present in the region. Contact World Express Travel to start planning your trip today!